Schnittke’s Concerto for Piano and Strings is one of his most popular works, but it’s been a slow burner on disc, a recording every couple of years since early 90s (it was composed in 1979). The concerto is unquestionably one of Schnittke’s greatest works and, despite its often intense dissonance, it’s one his most accessible too. 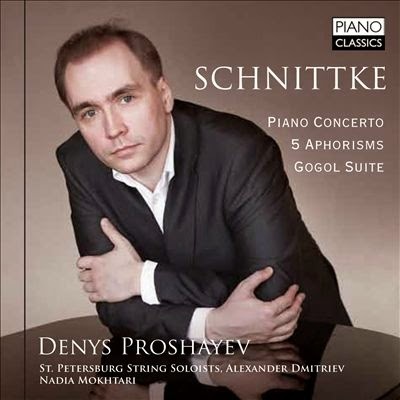 Those unfamiliar with the composer’s work could do worse than starting here, and Denys Proshayev’s reading makes an excellent case for it: clear, lucid, and engaging throughout. A brief word on nomenclature: The cover describes the work as “Piano Concerto,” a singularly unhelpful designation, given that Schnittke wrote four. But each is for a different ensemble so the full instrumentation will usually suffice, in this case concerto for piano and strings. There has been a tendency in recent years to number Schnittke’s piano concertos, but it hasn’t really caught on. If and when it does, this one is No. 3. The concerto was written for Vladimir Krainev, who was Proshayev’s teacher, and to whose memory this recording is dedicated. Krainev premiered the concerto with Alexander Dmitriev, who also conducts here: valuably continuity indeed. Proshayev has a clear tone and lucid technique. He prioritizes clarity over histrionics, yet never skimps on drama. If the reading occasionally seems overly controlled, that is only by comparison with some of the more impetuous readings out there, which seem messy in comparison to him. He has an excellent feel for the music’s quasi-liturgical atmosphere, something that comes across all the better for the church acoustic in which the recording was made (the concerto was recorded in St. Petersburg, the other works in Berlin). Working with a Russian string ensemble has the advantage that the players really understand the significance and the gravity of the quotations from Orthodox chant. A few more players would have helped though, as the string sound is often very thin (the Russian score gives 6,6,4,4,2; the Western edition 12,12,8,8,4—we’re clearly in the former category here). Schnittke doesn’t help matters by demanding big, round textures but for harmonies that are intensely dissonant. The smaller ensemble does have the advantage of allowing a very natural sense of balance with the piano—everything is always clearly heard and without any sense that the strings are being restrained for the pianist’s benefit. The number of versions of this concerto currently available is at least into two figures. An episode of BBC Radio 3’s Building a Library a few years ago went through those then available and come down in favor of Viktoria Postnikova and Gennady Rozhdestvensky on Erato (now also on an Apex reissue). Though I haven’t heard that recording in some years, I remember it being more incisive than this—less atmosphere but more drama. At any rate, Proshayev comes in pretty close to the top, even in a crowded field that also includes Marc-André Hamelin, Roland Pöntinen, and Krainev himself. The disc opens with the Five Aphorisms, a late work, written in 1990. Its textures are ascetic: The liner note by Susanne Stähr cites Webern as an influence. As with Webern, there is a fine line here between studied austerity and casual indifference, so maintaining the sense of concentration is crucial. Proshayev manges that well—the silences are as meaningful as the sounds. The benchmark is Boris Berman on Chandos, but again Proshayev is competitive with the best, and has marginally superior sonics. The Gogol Suite presents Schnittke’s lighter side—it is slapstick theater music, full of comedy effects and gratuitous historical quotations. It’s another work with identity problems, also going under various translations of Gogol’s title: Dead Souls, The Dead Soul Register, and The Inspector’s Tale. What we have here is twice removed from the original incidental music, which was arranged into an orchestral suite by Rozhdestvensky and from that to a two-piano version by Valery Borovikov. One of Rozhdestvensky’s movements is omitted, but as that accounts for less than a minute of music, it’s no great loss. The absence of an orchestra is more keenly felt, especially as most of the historical references—Beethoven’s Fifth, Swan Lake—are from orchestral works. It is a shame to lose the comb-and-paper episode in the finale too. Well played though, by both Proshayev and his duo partner Nadia Mokhtari. They really get into the spirit of the piece, plenty of slapstick, and this time not even a hint of undue restraint. A well played and well recorded program then. My only complaint is with the selection of works, which seems almost random, moving between eras and performing forces with each piece. There is plenty more solo or concertante music that could have filled out the disc, and the result would have been more coherent. Also, the Five Aphorisms are actually for piano and reciter. The idea is that poems by Joseph Brodsky are interpolated between the movements. Schnittke wisely chose a poet who wrote in both Russian and English, facilitating performances in both East and West. But as yet, nobody has recorded the Aphorisms with the poems included. No reason then to direct the blame specifically at Proshayev, but it would have made a good selling point. Otherwise, the disc is recommendable primarily for the concerto. This review appears in Fanfare Magazine, issue 38:5.